After much deliberation, I have decided to publicly release the digital conversion I made of the Aliens Boardgame, by Leading Edge Games. That company has been out of business now since circa 1993, and this digital conversion is being offered for free, and only to a limited audience (BRPG users). I have tried to contact the game's designers, Barry Nakazono and David McKenzie, in order to get official permission for this release, but I have been unsuccessful. If anyone from the former Leading Edge Games or 20th Century Fox has a problem with this, please contact me and I will promptly remove the file from my servers. However, I doubt this will ever be an issue, since the game already exists in [urlx=http://www.newgrounds.com/portal/view/408816]a solitaire-only Flash game[/url], and no one seems to mind. Furthermore, the entire game is available from BoardgameGeek.com[/urlx], such that you could create a "Print and Play" copy for yourself. Again, no one seems to mind. Note that this is not a FULL conversion. Only one of the three Scenarios from the original game is included ("The Reactor Room"). Anyone interested in purchasing a physical copy of the boardgame after playing this should look for it on eBay, where it occasionally is offered for sale. 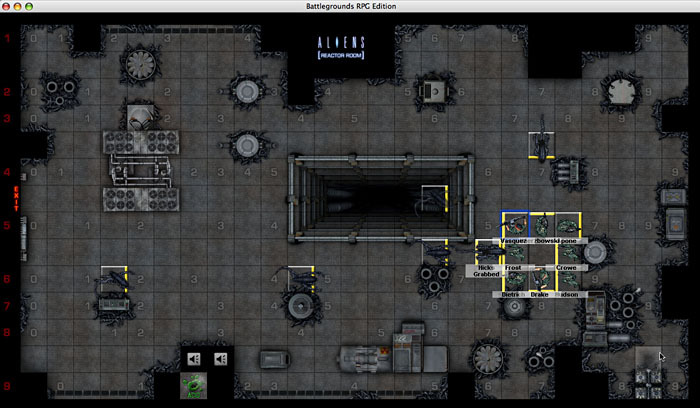 9 Colonial Marines with limited armament must fight their way through the alien-infested reactor room to the APC that will evacuate them to safety. Fans of the Aliens movie should find this game very enjoyable, and fans of the boardgame will be pleasantly surprised by how much the gameplay and atmosphere are enhanced by the software. I love the Aliens Boardgame, and I hope more people can enjoy this long-out-of-print game by playing it using BRPG. Given the enhanced graphics of this version, and the addition of theme music and sound effects, coupled with some convenient "automation" provided by BRPG's features, I honestly believe there is no better way to play this game. The game rules are not included in either of these downloads. BRPG v1.6m or higher is required to play. Legal Stuff: All trademarks and copyrights remain property of their respective owners and are used without permission. Here are some screenshots of what the game looks like. Click on each image to view it at full size. "An easy-to-learn game that really captures the atmosphere of the movie. The squad-based strategy changes depending on the current Marines alive and their positions. The Aliens come out of the walls and make for a tense game." "The best licensed game ever, IMHO. I'm still playing it regularly MANY years later!" "Love this game. The cooperative play makes it a rare gem, and the theme of the movie is fulfilled. For a fast, fun paced game where everybody plays as a team this is the bench-mark. Hard to believe nearly 20 years later that no other game mechanism for cooperative play without a GM comes close." "Not only the ultimate movie-themed boardgame, but also the best easy-to-learn tactical combat-game ever bar none. The way this game elegantly simulates with it's well-written rules-set the heart-wrenching dillemas the marines have to face being surrounded by an overpowering deadly enemy...sheer brilliance. No other horror game creates such a claustrophobic, intense mood." "My favorite coop game of all time with a really great theme and feel for the movie." "Undeniably one of most action packed, tense, and fun board games ever made. It will make all the difference if played correctly with those that can immerse themselves into the theme." Last edited by heruca on Wed May 18, 2011 10:10 pm, edited 8 times in total. Awesome, glad to hear its finally available. One of my favorite games. I've run it for kids a couple of times at a convention. (Hurricon or Recon in Florida). I run it on blown up mapboards so I can use the Leading Edge 25mm Marines and Aliens. Have you tried the expansion module? Adds a few more scenarios. Yes, I have the Expansion. Makes a good game even better. Someday I hope to make a nice hi-res map to play the Expansion's scenarios. Rules for Aliens Board Game. heya Heruca, thanks for posting this! I'm wondering if those places that have the game up might have a rule book I could DL. I don't really want to have to buy the game on E-bay just to play it via Battlegrounds ya know. I think I'll head over to boardgameGeek.com and see if they might have a pdf or something. Hey zWolf! See the ReadMe file in the Aliens download. I did just Order 'Space Hulk 3rd ed.' from Amazon... it's pricey but from what I hear it will be well worth it for the game play. I wonder how difficult that game would be to transition over... Aliens looks pretty close. oh the unlimited possibilities that your Battlegrounds software provides! just barrels of fun waiting to happen! I've updated the OP to include some gamer quotes about the original game. Thanks Heruca!! I'm looking forward to playing this with some friends! I never seem to have the time I think I will though heh. I hope all is going well for you, sad about FUM eh? 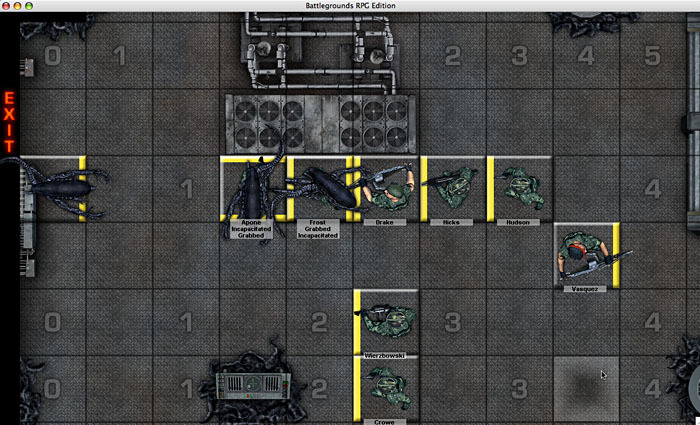 I uploaded a new version of this game conversion, for use with BRPG v1.6m or better. Some minor improvements and fixes. Use the download link in the OP to get it. By the way, there is no longer a separate GM version and Player version. Can you e-mail me all the Aliens Battlemap you have? I already got the Battlegrounds files........was just hoping to have the maps themselves. Try not to enter your email address publicly. The profile link to your email is kept private from spambots, but posts are not. You can download one of them from here. But the one I made is strictly for use in BRPG or BGE. Sorry. I would be more inclined to use an art program to make your own map(s). It has been suggested to me to use Dunjinni, and I can say using it is fun, easy, and satisfactory, so I will suggest it to you. I will have to check that out as well. Also, I DL'ed Gimp, and the extensions. You can do maps on that one too. And add hex numbering. I will try to conjure up the links. I was just hoping to pick up some already finished maps. I can't download that map you linked to because i'd have to register an account with that website which i don't want to do. Could you just e-mail me the maps?